Hahah, it's exactly like that! I need to get this off my chest. I am American. I spoke Japanese as a teen. I learned French to fluency...lived in Alsace. I moved to Germany and learned DE(Baden). I then moved to Lithuania (learned LT and Russian), Now I'm living in Rome. I am in so much pain. 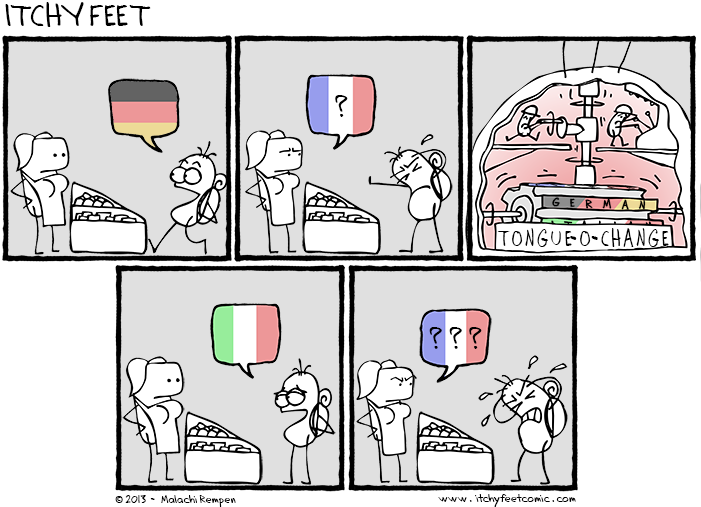 I feel your pain, minus like 5 languages. Haha, I was in Malmö a little while ago and so far the only foreign language I had to order kebab/döner/gyros/whatever with was German. I kept trying to talk to the poor guy in German even though I had been speaking English and Hungarian, and reading Swedish the entire day. This happened to me when returning from Germany to Colombia, via the US, in an American airplane. I mixed up all the languages when I tried to speak to the flight crew.